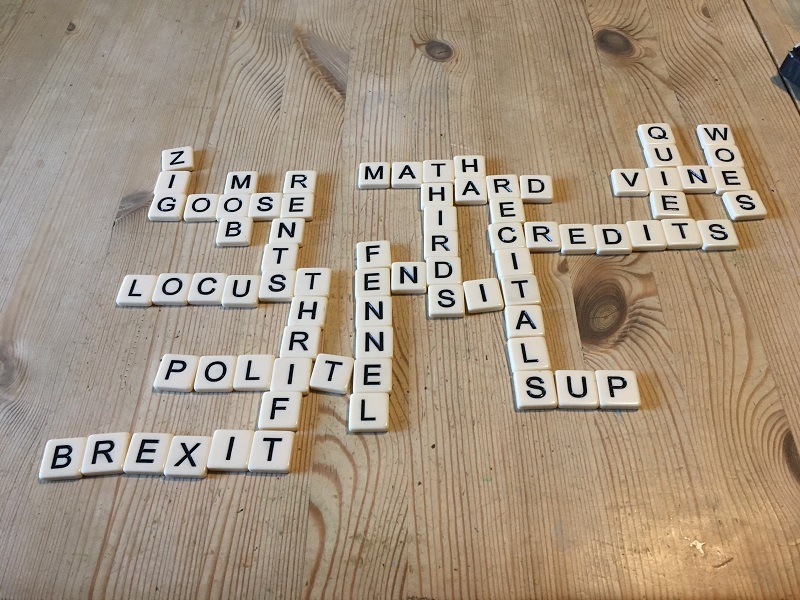 I’ve been aware that Bananagrams existed as a game for some time now – indeed I even interviewed the founder of Bananagrams on this blog six years ago. But I wasn’t really sure that the game was for us, as up until recently the children haven’t really enjoyed word games like Scrabble and similar. My daughter (15) is quite wordy and enjoys anagrams and word puzzles – my son (13) is much more mathematical and logical, whch puts him at a big disadvantage. But we have reviewed a whole lot of games recently and the family have got used to the fact that not every game suits every person, so they all pitch in and have a go at all of the games we try. On this occasion, my son has an extra week of half term , so there were just the two of us at home when we decided to try the game. 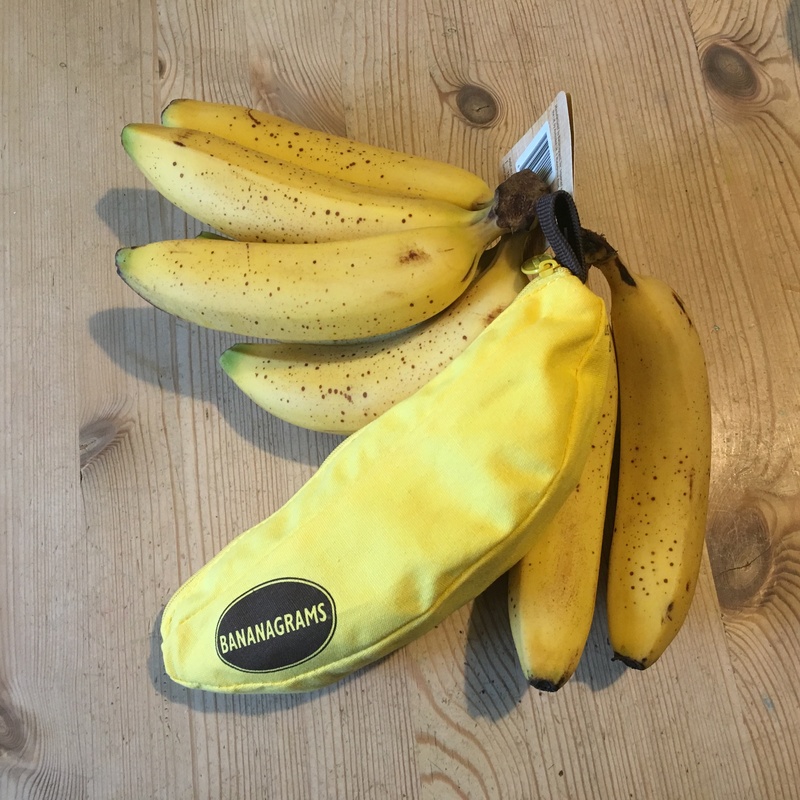 The game comes in a handy little carrying puch, which looks (surpisingly) like a banana. Inside the pouch are 144 letter tiles – a bit like Scrabble but without the points scoring on each letter. The tiles are also smoother and very satisisfying to the touch. When you start the game all tiles are face down on the table in front of all players, and each player picks a random selection of tiles; if there are 2-4 people, 21 tiles each, five or six players, 15 tiles each, seven or eight players, 11 tiles each. As soon as all the players have drawn their requisite number of letters, some player, any player, says, “Split!” and the game begins. You turn your own tiles up and start to form them into a crossword-style grid, like Scrabble. When a player uses up all of his or her letters, he or she states, “Peel!” Then all the players must draw another letter. Players can rearrange their letters as often as they like, even letters they have already placed. If a letter is drawn that seems impossible to place, a player may call out “Dump!” and exchange this letter for three others. No other player should take a tile on a dump. Play goes on until there are less tiles in the bunch than there are players. Then the first person to use all of his or her remaining letters says, rather excitedly, “Bananas!” This person will be the winner of the “hand” if all of his words check out. All of the players inspect the “winning” hand, and decide whether all of the words are acceptable (you can decide as a family what constitutes acceptable). There is no penalty for challenging a player’s word. 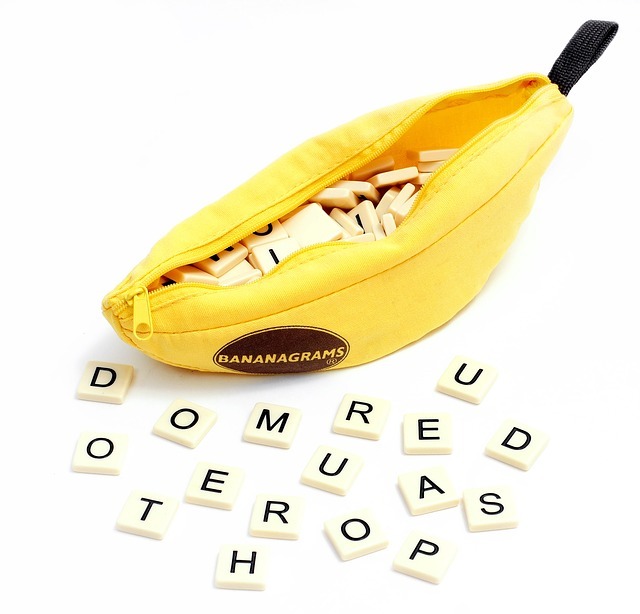 If an illegal word is found in the played “hand”, that player is declared a “rotten banana” and is out of the hand. His tiles are returned to the bunch, and play is resumed as before. So we had a goat playing Bananagrams. My son was in Scrabble mode, looking for long and complicated words – ultimately this was his undoing. Overall, even though words are not really his thing, my son said he really enjoyed the game. I’m looking forward to playing it as a family now, or possibly in a larger group when they have friends round. It would also be a great game to take while travelling. 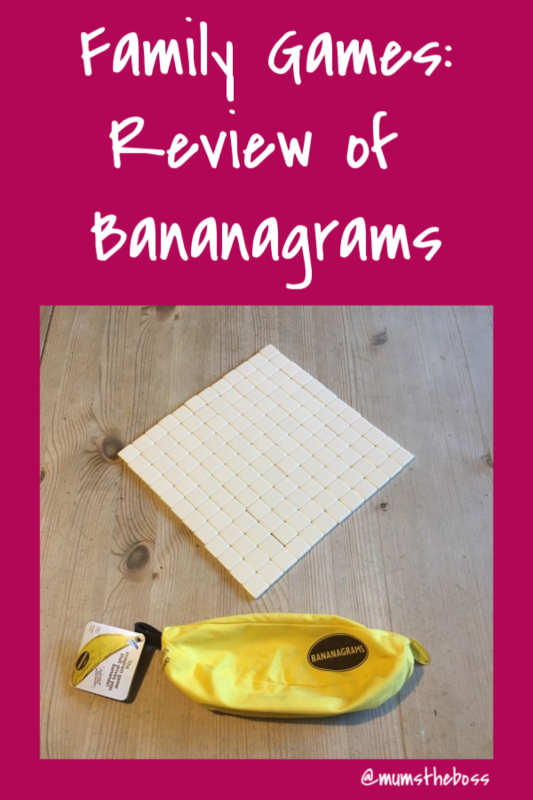 Bananagrams is available on Amazon (affiliate link) and in most major retailers. The link above leads to a page where you can see the basic version and also a couple of advanced versions with additional tiles.